Dr. Gary M. Ciepluch retired June 2017 as the director of bands and at Case Western Reserve University, conductor for the University Circle Wind Ensemble, and founder/ music director of the Cleveland Youth Wind Symphonies. His teaching responsibilities were in the disciplines of conducting and music education. A native of Milwaukee, Dr. Ciepluch received a Bachelor of Music Education degree from the University of Wisconsin-Madison, a Master of Music Education/ Conducting degree from the University of Michigan-Ann Arbor, and a PhD in Conducting/Music Education/Curriculum and Instruction from the University of Wisconsin-Madison. He received a clarinet performance certificate from the Institute of Advanced Musical Training in Crans, Switzerland. Dr. Ciepluch brings a broad knowledge and background in contemporary wind music and music education. He was assistant director and acting director of bands at the University of Wisconsin-Milwaukee, director of bands at the University of Dayton, and the director of bands at Whitefish Bay High School in Wisconsin. In 1999, he was awarded the distinguished Carl F. Wittke Award for Excellence in Undergraduate Teaching. Dr. Ciepluch continues to conduct numerous premiere performances and has won the praise of many composers including Olivier Messiaen, Karel Husa, Paul Turok and Donald Erb. In a CD release of the music of Donald Erb, In Tune Magazine writes that the “performances are superbly subtle. Conductor Ciepluch has emerged as a star among band directors: a refined musician with a keen interest in serious modern works, and the technique to cope with avant- garde demands.” His university ensembles appeared at local, state, national and international conventions. The focus of his research and writing continues in identifying band/wind ensemble music for all-level performing ensembles. 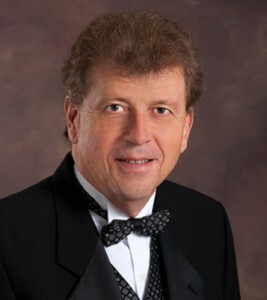 He is co-author of Best Music for High School Band/Wind Ensemble, and as a member of the National Band Association, Dr. Ciepluch served as chairman of the selection committee for the annual NBA Composition Contest. In addition, he is an active member of the College Band Directors National Association and past president of the Ohio Private College Instrumental Conductors Association. Since 1994, his Cleveland Youth Wind Symphony performed on 12 international concert tours, traveling to Germany, the Czech Republic, Sweden, Norway, Denmark, Switzerland, Italy, Australia, New Zealand, Ireland, France, Scotland, England, Spain, Portugal, Poland, Hungary, Luxembourg, Austria, and the Netherlands. In February, 2015 the CYWS I performed at the Ohio Music Educators State Convention in Cleveland for the ninth time, and in January 2016, Dr. Ciepluch was recognized as the 2016 Outstanding Educator for “exemplary leadership, service and commitment to excellence in music education” by the Ohio Music Education Association.